At a recent FMCA rally that I attended, we heard about a terrible situation that once again emphasized some of the basics that we all need to be aware of. A couple, in their early 60’s, together with someone in their mid ‘70’s were travelling in the southwestern USA in a bus style diesel pusher RV. The right front tire blew out and caught fire. That fire prevented them for exiting through the front door. Unfortunately all three perished and were found in the rear bedroom of the coach. Three points immediately come to mind: Was there anything they were doing that caused or contributed to the tire blow out? Why did the tire burn so quickly and why did they not exit through the emergency exit found in every RV? It is speculated that the driver was riding the RV brakes while descending a long downhill run, causing the front brake drum temperature to exceed safe levels and warming up the tire rim. That heat was transferred to the tire, which eventually blew out. The overheated tire caught fire, burned quickly and the fire spread to the coach body. It is possible that the blown tire took out the fuel filler line found immediately behind the wheel well, allowing diesel fuel to feed the fire. Thus, it is possible that driver error contributed to the situation. What is unexplainable is: Why didn’t the occupants exit the RV by using the Emergency Exit? Had they ever attempted to open the Exit (window) prior to the incident? Was it operational at that time? Did they know how to use it to exit? Were they overcome by fumes from burning fiberglass before they could carry out an emergency exit procedure? These questions may never be answered, although an investigation into the incident may provide some insight into their actions prior to dying. Know where your Emergency Exit is! The first lesson we all can learn from this incident is to locate the Emergency Exit in our coaches and learn how to open it. Either the hardware retaining the Exit Window will have red handles or there will be a Red lettered EXIT sticker near (or affixed to) the window to identify that this window is the Emergency Exit. (See Photos) While there may be more than one exit, the primary one will be on the opposite side of the coach from the entry door. 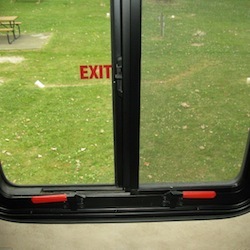 Our Coach has one Exit located on the driver’s side, mid coach which is a conventional window over our couch with an Red Exit sticker and Red Closure Latch on it. The window is substantially larger than the similar window over the dining area. The second exit is in the bedroom and it is on the same side of the RV as the door. It has a Red Exit label and two Red handles that pivot 90 degrees to release the whole lower section and the window which is "hinged” at the top allowing an exit through the larger window opening. 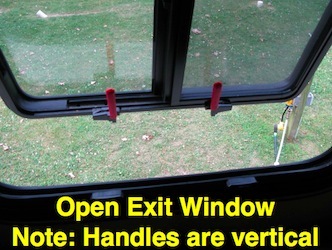 The Exit window in your coach may be very stiff to open if you have never tried to open it before. Push firmly on the lower section of the window after releasing the retaining handles. This should dislodge it and allow it to swing out from the bottom. The whole window assembly will open and separate from the window frame that is attached to the RV body on three sides, continuing to be attached at the top. (See Photo Below) Once it is operable, I recommend lubricating the sealing rubbers with ProtectAll™ Rubber Slide Seal to provide lubrication and maintain the rubber. I have noticed that sometimes after the window is opened (after never having been opened for many years) that after re-latching the window to the frame, it may not provide a water tight seal. Simply open and close it a couple of times and apply lubrication and the window will seal. Some older coaches use a cable to release the window and it may be very stiff (potentially breaking the cable if it is corroded). 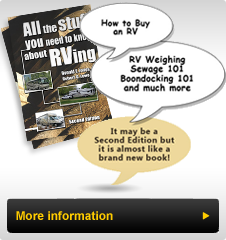 This opening system does not apply to Bounders, however some late 1990’s vintage RV’s will use this design. Now that you have confirmed where your Emergency Exit is, how to open and maintain it and understand how to exit, there are two additional steps to take prior to the dreaded emergency. First, prepare an emergency exit kit that contains essential documents, keys for the towed vehicle, medical prescriptions and anything else that you must have with you personally in a catastrophic event. This should always be located immediately in the area of your Exit window. Second, practice exiting with all occupants, with your pets out and strive to meet the time frame of 30 seconds or less. Have each regular occupant routinely open the Emergency Exit, prop the window up and placing the bedspread on the frame so that everyone is familiar with how to do it. When you travel with people who are unfamiliar with RV travel. inform them of what needs to be done in an emergency. Check your fire extinguishers to ensure they are fully charged at least twice a year. RV’s are required to have one in the entrance door area. Routinely remove it from the support clamp and turn it upside down. You should hear the powder move inside. If it is packed, turn it upside down and firmly strike the bottom to loosen the material. Place additional ones, designed for RV use, in each area of your coach, where they will be accessible in an emergency. We have ones containing foam in the galley area and another in the bedroom, a third in the driver’s seat area, in addition to factory installed one at the door. Be vigilant and be prepared as you RV. Safety is always a priority and as we recently learned your life and those of your loved ones may depend on how prepared you are.